At Per Sempe Toys we do business for some time with Win Green. What appealed to us is that the tents are made of natural products and also help women in India in order to provide for their maintenance. And,since there is a lot of handwork in, we actually cannot show you a picture. They are really gorgeous! We often get questions about sizes, colors etc. Sometimes its name is also written as Wingreen. Most Win Green play tents come in two sizes: small and large. Every situation is different, of course. But when the room is sufficient we often recommend our customers the big Win Green Play tent. That makes playing with several children easier and then you have a few years of fun with a play tent. It is after all still a whole issue! 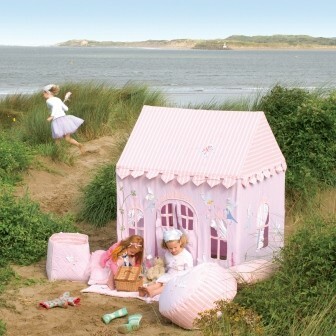 The handmade Win Green (or Wingreen) play tents are embroidered and have applications. 100% cotton, hand-woven and dyed and come in a superb range of colors and designs. A children's room can be transformed with a play tent for kids in a theme room. The plays tents come in different themes: A tale with elves and cupcakes, Fire department, ranch, a garage or a boathouse. If you use the Win Green (Wingreen) play tent used to decorate the kids room, there is a whole range of accessories in the assortment. From toys bags for the toys, an ottoman or beanbag, linens and bedspread and pillow cases, and of course a floor mat or quilt. You can always make an appointment to view the play tent of your dreams or ask us to send you a sample so that you can check that the color matches the kids room. Playing cowboys and Indians is always fun. If you are going to buy a Win Green wigwam (Wingreen), you get a luxury toy tent with mountains, cacti and horse carriage. 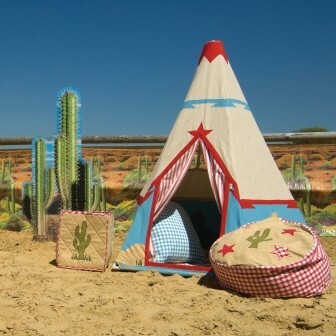 The customers who buy a wigwam at Per Sempre Toys, use it often as a place where a child can withdraw. Buying wigwam? At Per Sempre toys you can find play tents, wigwams but also pending tents, pavilion tents and even play tents for your dog! But there are also wigwams, hanging tents and cabanas and pavilions for the outdoors. Which can include areas near the pool. Click here to go to the Win Green products (Wingreen)!